Do you ever wonder why kids like to be read the same book over and over again? Or play the same game, or watch the same movie, over and over again? I wonder about that. One guess I have is that they want to master the content. Another is that, when you’re young, everything is wonderful, and few things get boring. When you find something you enjoy, you want to keep enjoying it. It takes a while before it loses its novelty. 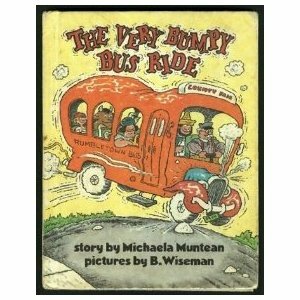 My 3-year-old son Lucas has a favorite book that we read almost every night: The Very Bumpy Bus Ride. He also likes it when Sammy (9) reads it to him. But one night—I can’t remember how this started—we started being silly about how we read the words. Oh yes, I remember that, after Sammy had read it to him for several nights, when I came back, he thought it was funny how I said “Mrs. Fitzwizzle.” All I had to do was say that once and he would crack up. So I tried saying it several times in a row, and he cracked up even more. I can still get him to laugh, just by saying that name. From there we started messing with the other words. Doing baby talk or talking like a ventriloquist or flipping the sounds around, as in “The Bery Vumpy Rus Bide.” (This spoonerism approach in particular cracks Sammy up.) Now Lucas contributes to the word massacre by mixing his sounds around and being silly about it. He practically has the whole book memorized, so he’s getting pretty good at saying the sentences while flipping the sounds around, saying nonsense words that rhyme with the originals. In the past, I might have had some concerns about this game, fearing that he’s learning the words the wrong way. But now I laugh at the thought. He clearly knows the words, and adding this layer of processing complexity (starting with the original and coming up with a non-sensical rhyming word) does two positive things, as far as I can tell. It reinforces his knowledge of the words by engaging with them in new ways. And it makes him want to continue by keeping things fresh and fun. If you want to hear more stories about the diverse ways in which kids engage words and eventually learn to read, I highly recommend Peter Gray’s recent article about this topic: “Children Teach Themselves to Read” .